The chicken equivalent of Scooby-Doo. 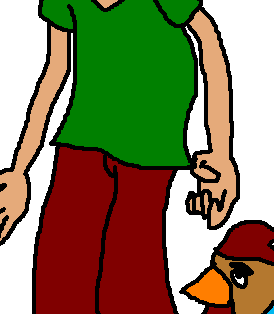 Look at Shaggy Chaggy and his pet dog chicken. He's a real coward and I drew up the Scooby eyes and used a roughly Scooby-Doo color. Also this is part two of my 2010 Halloween updates. EDIT: I forgot to say, "And Scooby Doo was a chicken to begin with." Also the left hand is backwards. Wooo! Two updates in one day! AWESOME. Scooby Doo would have been MUCH better as a chicken...for sure. This is awesome!! I agree that Scooby would have been really good as a chicken. If only to make Scrappy Doo cuter (he was so not cute) and less annoying (hopefully) if he were just an adorable, yellow chick.